¡Hola a todos! I’m from Cali - Colombia. I have a Bachelor's degree in Modern Languages and I’ve been teaching for 19 years, 4 of them online using ICT tools. I am currently teaching English in a University. I’ve worked as an English and Spanish teacher for schools, institutes and universities; I’ve taught to all ages, children to senior citizen, complete beginners to advanced. I’ve had trained state teachers in methods and pedagogic strategies to teach foreign languages. I contributed in the research and textbooks production at a Center of Applied Linguistics. I have also taught basic French to absolute beginners. I have, moreover, participated as speaker in diverse seminars and symposiums at public and private Universities in my country. 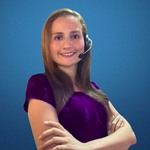 I also worked as a journalist for radio and TV and as an audiovisual editor for 6 years. In addition, I worked as an International Communicator for the event The World Games 2013 – Cali. I am also a poet and a script and children’s story writer. I’ve led literary workshops in both languages: Spanish and English and won awards in literary competitions. I have also cooperated in social work through pedagogical programs with children and led a campaign against child sexual abuse. I hope that my experience in these fields can contribute to your learning. I really love teaching and even more by using ICT tools! I consider myself friendly, patient, creative, respectful, kind and very professional. My classes are very didactic. You’ll have fun learning and developing communicative skills in this wonderful language from the first session. Design, teacher training, and language teaching. ¿Alguna película o serie de televisión Latinoamericana que te guste? ¿Alguna vez has organizado un Playdate con fines lingüísticos?